Yes. You read that right. We have another Andie in the house!! 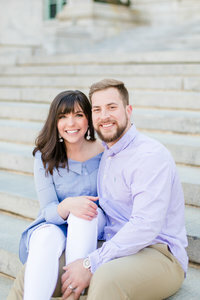 It was so funny to guide Andie and Rich through some of their poses during their Old Town Alexandria engagement session because it was just so new to me to say my own name to someone else! But I wouldn’t want to share a name with anyone other than Andie because she just is the CUTEST lady I have ever seen! Andie & Rich are high school sweethearts! Andie went to an all-girls private high school, but she was a dancer and she had a lot of friends from her dance team. One of her friends from the dance team went to high school with Rich and she introduced them! They started dating in back in 2009 as juniors in high school! Then, she went to Ithaca College in upstate NY and Rich moved to Maryland where he was a live-in firefighter and took college classes at night. They did the long-distance thing (8 hours!!) for six years before Andie finally finished grad school and moved to Washington D.C.! For Christmas one year, Rich surprised Andie with a trip to Disney World which is her favorite place! She was so excited and she had NO idea that Rich had a secret plan… he was going to PROPOSE! Andie was just excited to be finally living together after six years apart! The first night of the trip, Rich wanted to take a picture in front of the castle. Andie didn’t think twice about it, so she waited in line for the picture while mentioning about how pretty Main Street looked. Rich then said, “I’ll ask if they can take our picture facing Main Street”. As it turned out, Rich was telling the photographer he was going to propose!! They posed for one picture, and then all of the sudden, Rich was down on one knee!! What a sweetheart!!! We couldn’t be happier for these two and we REALLY can’t wait for their wedding day in September!